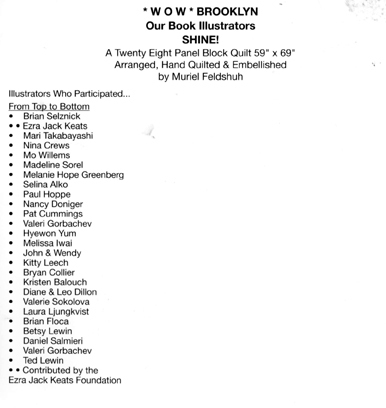 Thank You Melissa for including my Traveling Quilt Exhibit Celebrating Children’s Books in your wonderful Hungry Artist blog. My quilts have been traveling across The United States and have visited many children’s museums. The beautiful ‘green bean’ square you did for a previous quilt has been enjoyed by many children and adults as well. I’m sure that the new square you completed for my Brooklyn quilt will be loved by anyone who sees it. 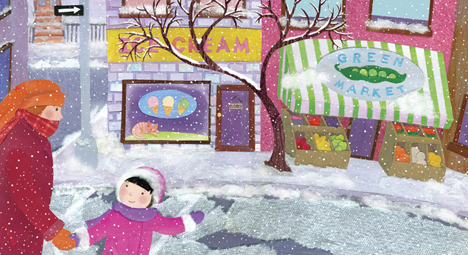 It is generous and talented illustrators like you who have made this project so much fun for me. 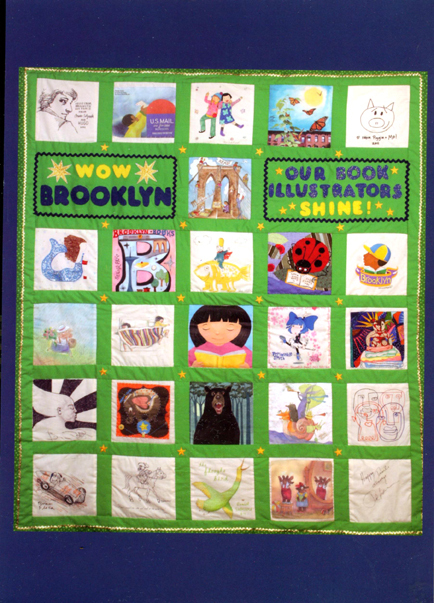 I hope that many of your readers will be able to view my quilts anytime from March 3rd- June 3rd when they are at The Brooklyn Children’s Museum. All the best and thank you once again. By the way I also enjoy seeing many of your excellent recipes. And yes, I forgot to mention that the exhibit runs until June, 3 (my birthday)! Melissa! Your collage and artwork is so awesome! 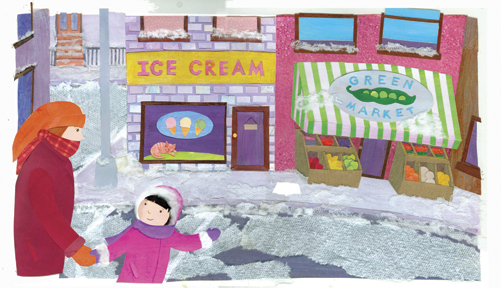 If you hadn’t explained the details about how you created that picture, I would have never thought that the snow was a paper towel or about the cotton either. It looks like you drew it! I will need to attempt a collage project with Bebe E. I try to do different projects to entertain her at home and she’s really taken a liking to crafts and art. Congrats on the quilt and hope you had fun at the reading/demo today! Happy Hinamatsuri Day! Also, glad you got the book! Hope Bebe E enjoys it! I just bought Good Night Engines for a friend’s baby shower. She had the brilliant idea of asking for signed books instead of cards. Why didn’t I think of that 10 years ago??? By the way, I just posted your great recipe for the mini Chocolate loaf! We love that recipe!